A rather disturbing video making the rounds online shows a giant coconut crab feasting on a seabird as it tries to escape. A crazy video has gone viral in recent days, depicting a huge coconut crab tearing into a seabird while it is still alive. The video, embedded below, shows this giant arthropod engaged in behavior that scientists rarely see, as the coconut crab is usually a vegetarian that uses its powerful claws for cracking open coconuts, as its name implies. But as we often see in the wild, sometimes animals have to be opportunistic about their meals, and that’s what this crab did when it came upon a sleeping seabird. The bird tried to escape, but once it was gripped by the crab’s powerful claws, it was game over, and the bird’s cries only attracted other crabs who came to get a free meal. 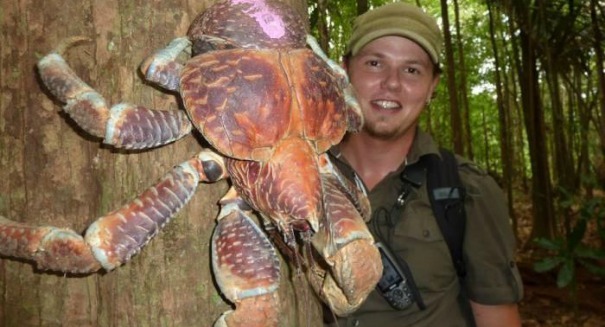 Coconut crabs are absolutely huge, stretching to almost three feet across when full grown. They’re able to achieve such enormous size thanks to the fact that they live on remote islands with no natural predators.